Evans Monument Company can deliver and install monuments all over the country. We personally install all of our own monuments locally with our own equipment. If you are a monument company, civic organization, artist or municipality, and would like to learn more about our nationwide installation services or equipment capabilities, please contact us. Our company has the equipment and resources to professionally install monuments and civic memorials of any size. 1. How does the monument get to the cemetery? 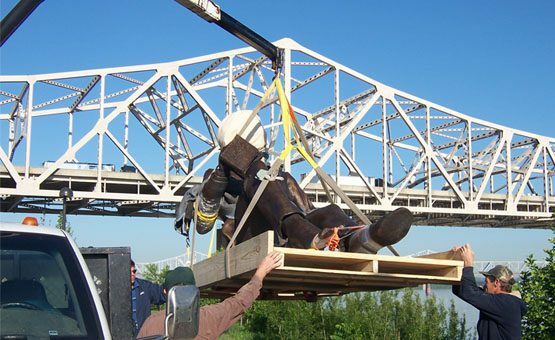 Once a monument is created, we transport it to the cemetery and set it into place using a truck with a hydraulic crane. When the work is complete, we notify the family and ask them to inspect the monument to ensure that all specifications have been met. If the monument belongs to a family living out of town, we e-mail photographs to the family members. 2. What is a foundation? Monuments are placed atop a concrete footer to ensure stability and durability. Some cemeteries require that the concrete footer must be poured by cemetery employees (for a fee). In cemeteries without this requirement, we pour the concrete as part of the installation process. 3. Can your company install monuments anywhere? Yes, we install monuments all across the United States. We have arranged for the installation of a monument in Anchorage, Alaska, and have traveled as far as the Caribbean to supervise the installation of a very large monument. Any monument, with the exception of a small marker, should only be installed by an experienced monument company. An average size monument will weigh several hundred pounds and can only be installed using specialized equipment.